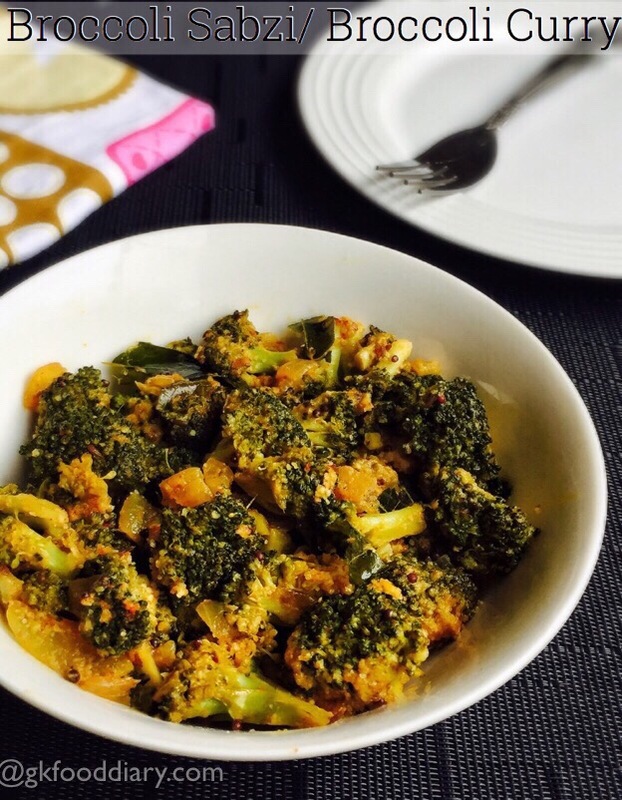 Broccoli Curry/ Broccoli subzi- easy, tasty and healthy dish made with broccoli and mild spices which is suitable for babies toddlers & kids. 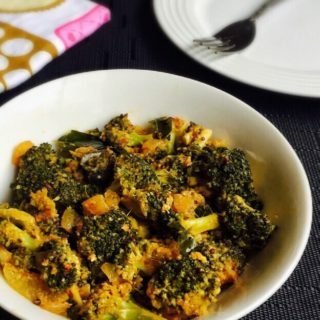 This broccoli curry can be perfect as a side dish with roti/chapati, jeera rice or even plain rice & rasam combo, also best as a finger food for babies. 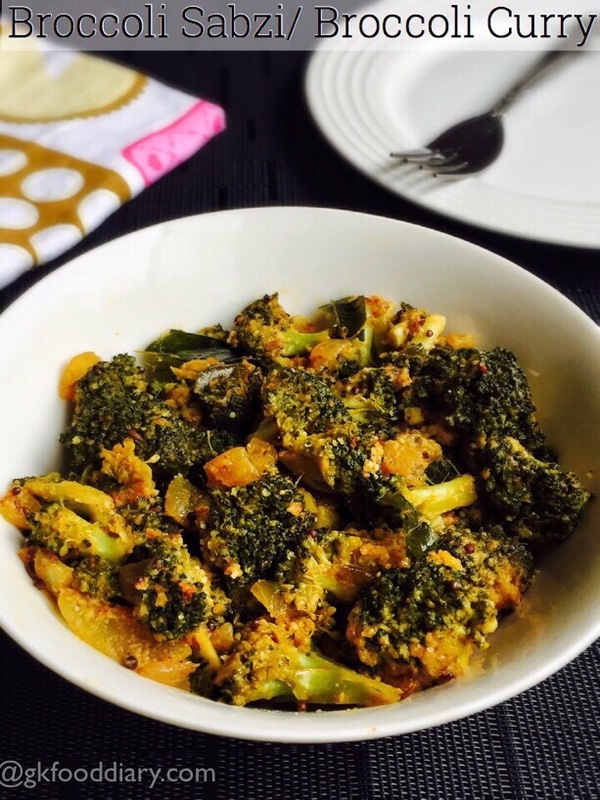 Broccoli curry is a must try for picky eaters as it tastes so good with the less spices added and touch of almond. Do give this a try, hope your kids like it! You can add any vegetables like potato, peas or carrot along with broccoli to make this curry. It can be given to babies from 10 moths once they started eating all family foods. 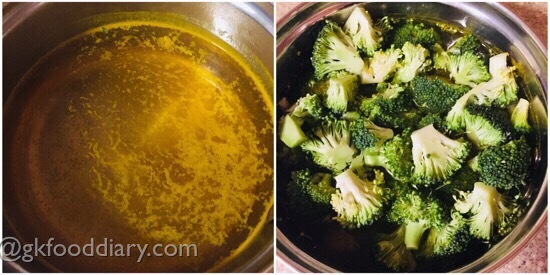 Here is how to make easy broccoli curry recipe for toddlers and kids. 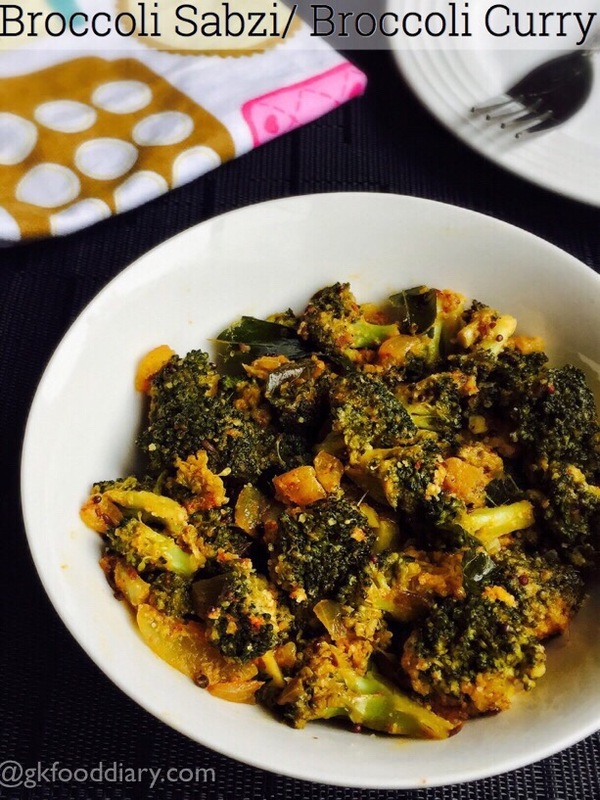 Broccoli Curry - tasty dish made with broccoli and mild spices. Wash the broccoli thoroughly in running water and cut them into small florets.Keep it ready. Boil water in a sauce pan with ⅛ tsp of turmeric and a pinch of slat. Once the water comes to a rolling boil, add in the cut broccoli florets and boil it further for 2 minutes and switch off the flame. Drain the water immediately and collect the broccoli florets. Set aside. 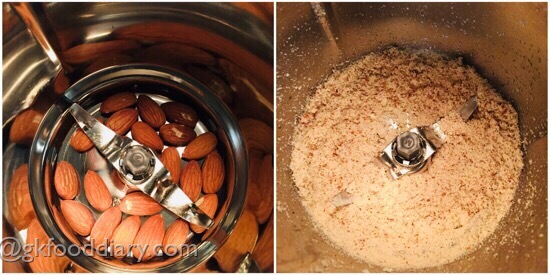 Take almonds in blender and grind it to a coarse powder. Grind it with little water to a smooth paste if you are going to serve this broccoli curry as a side dish for chapati/roti. 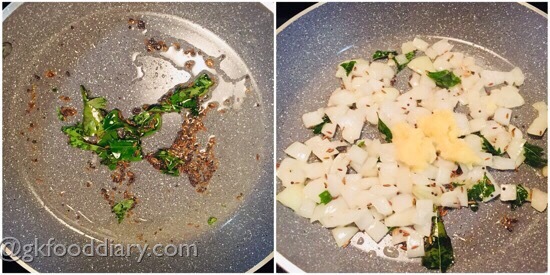 Heat oil in a pan and add cumin seeds and curry leaves. Saute until cumin seeds cracks. Then add onions along with ginger garlic paste. Saute onions until it's transparent and the raw smell of ginger garlic pastes leaves. 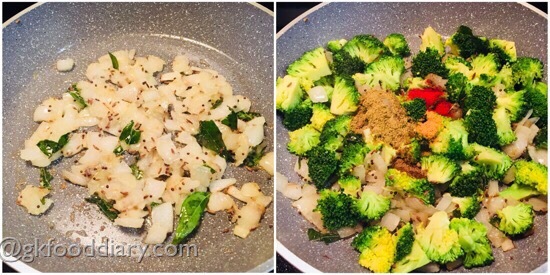 Then add broccoli florets along with turmeric,red chilli,coriander, garam masala powders and salt. Toss it well. 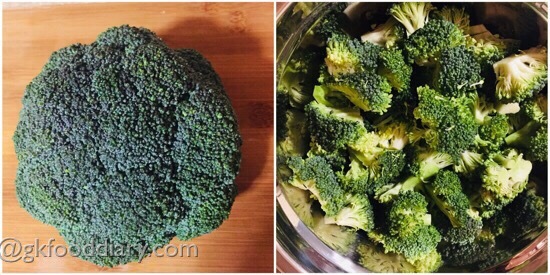 Add 2 tbsp of water and cook it covered for 5-7 minutes or until the broccoli is soft. Make sure the broccoli is soft enough to bite but not too mushy.Mix well. Open the lid and check the pan whether the broccoli is cooked well. Add the ground almond powder or almond paste at this stage and toss everything well for two to three minutes and switch off the flame . 1. Wash the broccoli thoroughly in running water and cut them into small florets.Keep it ready. 2. Boil water in a sauce pan with 1/8 tsp of turmeric and a pinch of slat. Once the water comes to a rolling boil, add in the cut broccoli florets and boil it further for 2 minutes and switch off the flame. Drain the water immediately and collect the broccoli florets. Set aside. 3. Take almonds in blender and grind it to a coarse powder. Grind it with little water to a smooth paste if you are going to serve this broccoli curry as a side dish for chapati/roti. 4. Heat oil in a pan and add cumin seeds and curry leaves. Saute until cumin seeds cracks. Then add onions along with ginger garlic paste. 5. Saute onions until it’s transparent and the raw smell of ginger garlic pastes leaves. Then add broccoli florets along with turmeric,red chilli,coriander, garam masala powders and salt. Toss it well. 6. 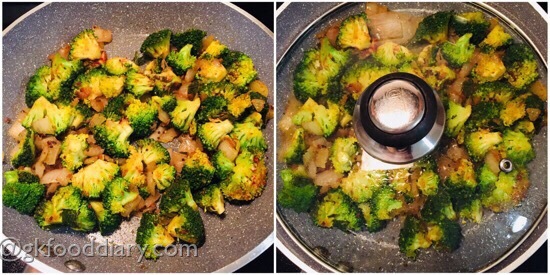 Add 2 tbsp of water and cook it covered for 5-7 minutes or until the broccoli is soft. Make sure the broccoli is soft enough to bite but not too mushy.Mix well. 7. Open the lid and check the pan whether the broccoli is cooked well. Add the ground almond powder or almond paste at this stage and toss everything well for two to three minutes and switch off the flame . The broccoli curry is ready! You could add one small tomato while sauteing (after onions) for a tangy flavor. 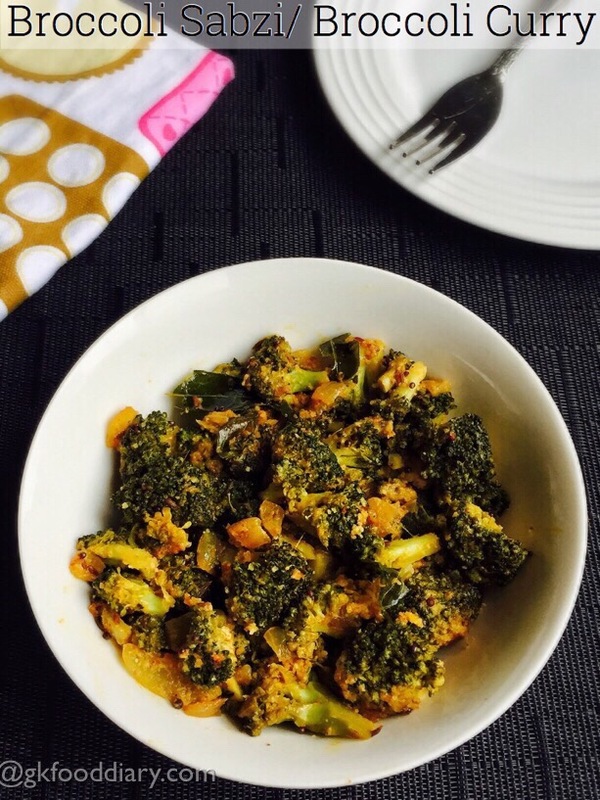 Grind almonds with little water to a smooth paste if you prefer serving this broccoli curry as a side dish for chapati/roti. 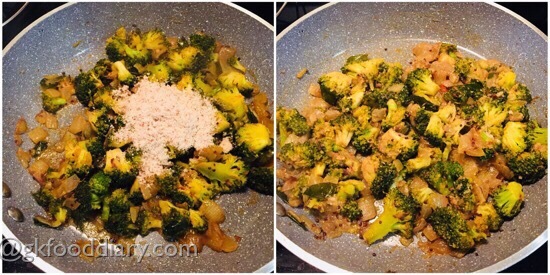 Any seasonal vegetables can be used to make this broccoli stir fry. The broccoli should be soft enough to bite but not too mushy. You could also shred the broccoli instead of cutting into florets if your child doesn’t prefer small florets. Adjust spices according to your child’s preference. Make sure to introduce everything separate to your baby before you try this broccoli fry.